Kenley had an important role ferrying Cabinet Ministers (including Winston Churchill), dignitaries and mail to the Paris Peace Conference that took place in 1919. Some of the planes used were converted bombers painted silver to look less war like. On the first night service on of the crew left the emergency hatch in the floor of the bomber open and, in putting on his lifejacket, accidentally inflated it. He moved up forward to ask the pilot what he should do and fell through the open hatch but was caught by his inflated jacket. He stayed there for the rest of the flight – cold from the waist down but alive! In the 1920s life was relatively care free and enjoyable for the young airmen. They flew the latest fighters, practice formation flying and showed their skills in aerial acrobatics. But it was dangerous too as aircraft technology was in its infancy, engines occasionally seized or parts broke. Your life depended on where this happened. Sports, theatre and music groups helped forge team building and provided entertainment. Pranks were tolerated until they got out of hand – such as flying beneath Tower Bridge on Christmas Day in 1926! 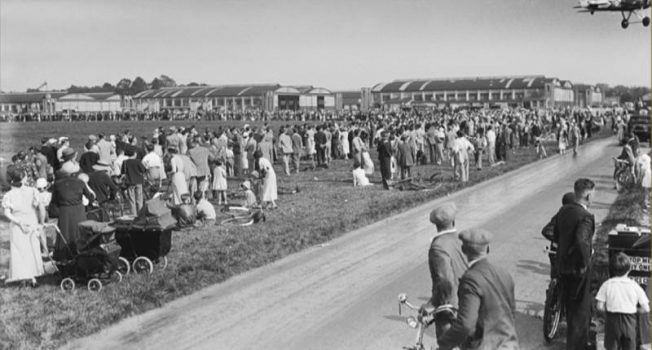 The station was rebuilt in the early 30s and, with worries about German military strength after Hitler’s rise to power in 1933, Fighter Command was born in 1936. The first monoplane fighter, the Hawker Hurricane, on which effective national defence depended, reached No 3 Squadron at Kenley in March 1938. This version needed more take off space than later ones highlighting the need to cut down trees nearby and provide the permanent concrete runways planned. 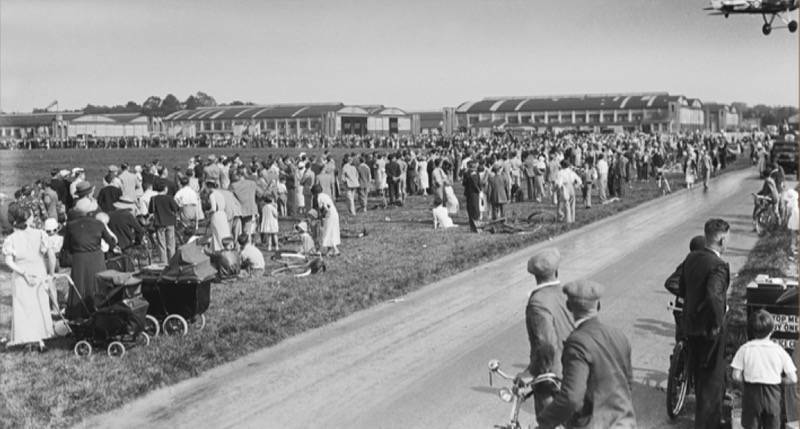 Annual Empire Air Days organised at British bases in 1934-39 provided entertainment and reassurance for the public and helped RAF recruitment.